This has been fixed in newer production and it is no longer necessary to apply this update. Thank Jacob. May I ask why the minimum is 42% fan speed on a card that runs at such a low temperature? Why not around 30%? Just curious. Thanks for the update again. I have EVGA GeForce GTX 750 Ti (02G-P4-3751-KR) and I have same issue with the fan noise, is some bios update for me? Becase if I cant repair this situation, then I must return this card and I buy Zotac with same chip. And second question - is possible apply bios update on linux? Sorry EVGA. the ACX cooler needs a revamp of serious proportions. After patching, fan noise is only low when running Microsoft Display driver. When installing Nvidia driver again it resumes full turbine levels. I have the same situation as mejje and Pirate85. After installing the BIOS update and rebooting, the card is quieter. After I reinstall the nVidia driver, the sound is back at its old level at idle. Just received my card, I am going to run the BIOS update, as I had the RMA and Return set up to get the Gigabyte card, and they are completely sold out now. Oh well, hopefully it isn't as loud as it is said when it is inside my Phantom Case. Well, it seems the Phantom Case is a wizard. With everything closed up, clean and set up, Folding with all three cards running at 100% and the Classified at +65 on the core, the 750TI FTW at +52 on the core, all I can hear are the case fans lightly humming and a slight coil whine from one of the classifieds. Glad I checked the card prior to sending this back, and this is the last time I make any claims PRIOR to dealing with it myself. EVGA_JacobF, can we expect an answer regarding the BIOS update not working after Nvidia driver install? Have you checked with the devs? I updated the latest drivers and now the card is loud again. I even uninstall all the drivers one by one reflashed the bios from this thread to see if i could get it back to how it was before but im not able to. these drivers are stable release so people are going to get prompted with update available so more people will be seeing this issue again. this is the bios thats on the card now. I have had the same issue as everyone above regarding fans reverting back to higher rpm's after installing drivers again. The 770/760 dual BIOS SKUs just got a firmware update to allow fan speed tuning below 42% with EVGA precision ... Will a similar update be released for the 750ti? I have the same problem! All fine without nvidia driver with it i get the turbine back :-( i hope you can solve this problem or i must send my card back to shop! http://youtu.be/D89czm6yK30 just watched Jayztwocents review. Watch it all the way through. To me, he is the most trustworthy reviewer available. Most others don't cover issues or they will give a little blurb but try not to offend the company. He flat out covers the noise problem outright. I can not hear mine, which makes me feel lucky. If Gigabyte had not been out of stock when I received the FTW, I would not have opened the box. EVGA, please do something about this issue. I am not sure if you can go lower as you used voltage regulation rather than Pwm, but with this many complaints, something has to give. just watched Jayztwocents review. Watch it all the way through. I asked about the SC model's noise level from one of the reviewers of the Digital Storm and I was told "pretty darn quiet". I do understand that people have different definitions for quiet, but no, this thing just isn't quiet. I have the Ivy i5 stock cooler in my system and I find it way more pleasant noise-wise. I feel sorry for some of the ACX owners if it really is even more louder than the SC. I hate to put this card on sale but I'm happy to pay a few euros more to get my hands on a more quiet one. Watch his review on the gigabyte.. the fan is locked at 52%, and has it tested up to 100%, and it is said to be completely silent. 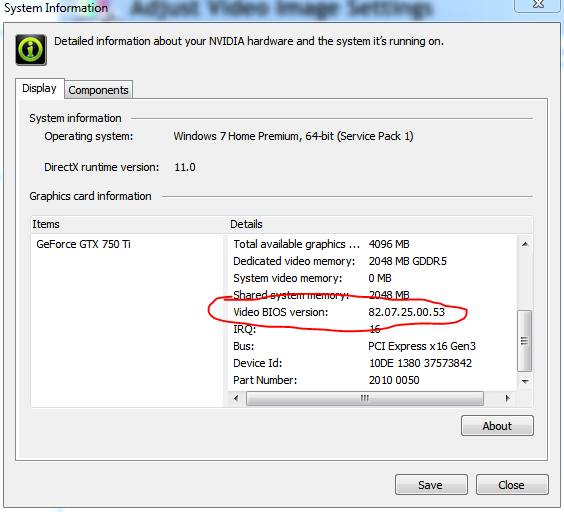 More detail for EVGA: after updating the drivers to the latest version, the fan is relatively quiet through the "Starting Windows..." screen, and then it becomes loud again at the login screen. Is another update being worked on? I have a fan cooled system, with a Be Quiet! PSU and an Arctic Freezing i30, and this is significantly louder. what is the version of this update? I don't want to flash the wrong card, or one that's already flashed. Anyone know about the part numbers though, so any others viewing this can be sure if it's ok ? Since I installed this card, including the Bios update less than a week ago, sleep mode on my PC-win7-64bit crashes when I try to wake from sleep. The power is on but nothing happens, with a blank screen. and I have to hard powerup to restart. Any help? Card has gone back, such a shame EVGA, would have been a great card, just needed PWM fans. I also have a problem after installing nvidia drivers. Fan noise is acceptable after updating the firmware, but as soon as I install nvidia drivers, the fans go back up! Is it the drivers or the firmware? So... 5 days without any information or reply? I build my my rig making sure my pc was really quiet (thats why I replaced the r7 260x so fast) but since I installed the evga-card all hell broke loose. In idle it´s three times the noise of the r7 260x under full load ?!? Now I´m very disappointet to find out that evga isn´t all it´s cracked up to be. Could you please at least give us any status updates ??? I thought this would be a great card for my super quiet mini-itx build! I did the firmware update which seemed to work well, but as others said the noise did go back up after the driver install. I really don't want to return this card, I think for the price/performance it was a great buy. Although, if the noise isn't fixed I may consider returning it. Idle noise way too loud! If a quiet PC really is important to you, as it was to me, I'd do the same, I'm waiting for the 8xx series cards now, with displayport for g-sync, and hope there are some real quiet solutions. After all, the 750ti is so cool running and so low power and that's a 28nm Maxwell chip, the 8xx desktop cards are meant to be 20nm. Maybe we'll be lucky enough to see some sensible company offer some passive cooling versions.